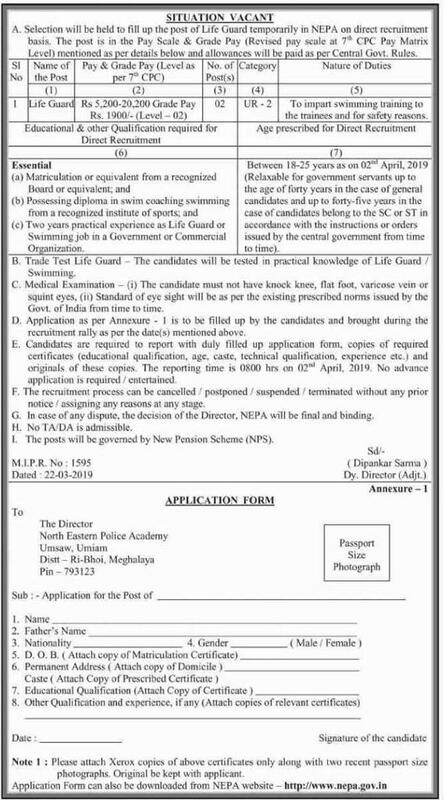 Selection will be held to fill up the post of Life Guard temporarily in North Eastern Police Academy (NEPA) on direct recruitment basis, The post is in the pay Scale & Grade pay (Revised pay scale at 7th CPC pay Matrix Level) mentioned as per details below and allowances Will be paid as per Central Govt. Rules. How to apply: Application as per Annexure – I given with the advertisement is to be filled up by the candidates and brought during the recruitment rally as per the date(s) mentioned above.